There is acute shortage of land in the Igbo states of Abia, Anambra, Ebonyi, Enugu and Imo, hence the increase in rent payable in the cities of the south eastern states. Apart from children, land and shelter are the second most valuable assets of any family in the southeast. As a result, it is a taboo in some places for people to sell land to strangers or non-natives without exhausting the family option to see if any of its members would buy. Families also, live in clusters and strangers are not encouraged to own properties in such clusters, leading to high demand of available land. In Anambra state, high cost of rents and accommodation is driving many people to the villages as many of them say their incomes could no longer match the rents charged by many landlords. Investigations by South East Voice showed that the reason for the development was due to the near total neglect of housing sub-sector by previous administrations in the state, as well as the dwindling finances in the country. For instance, a two –bedroom apartment, which attracted annual rent of about N120,000 in Awka and Onitsha, Anambra State, six years ago is about N250,000 at present, while a three bedroom flat that attracted about N200,000 per annum at the same period is now about N450,000, depending on the location. Similarly, duplexes and bungalows in highbrow areas in the two cities attract N1 million and N600,000 per annum respectively, while self –contained apartments which is very popular among undergraduates and unmarried workers, has increased from N120,000 few years ago to about N250,000 per annum. In all situations, the prospective tenants are usually made to pay agency fees of 10% of the rent before moving in, and an agreement fee that is also negotiable between the tenant and the lawyer involved. As a result of the consistent rent increase, many residents in the urban towns have been forced to relocate to their villages from where they transact their business. This has also affected many children who have been forced to change from schools in urban towns to rural schools with their attendant problems. Experts in the housing sector believe that the housing problem became very acute because the various administrations have not been investing much in housing development. For instance, since the creation of the new Anambra State in 1991, not up to 200 houses have been completed by any state government. 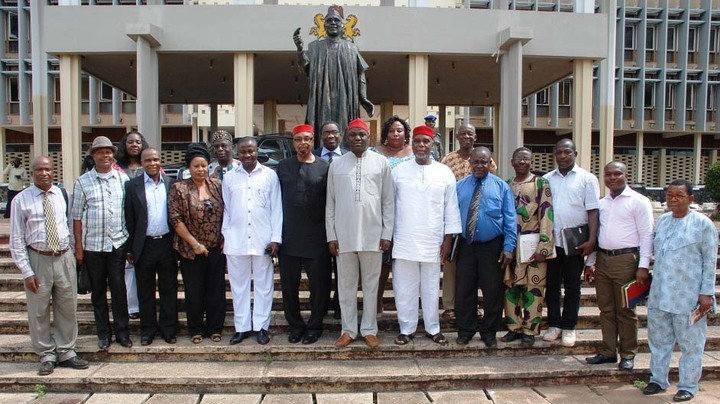 When civil servants relocated to Awka from Enugu after the state creation, there were virtually no houses in their new state capital and most of the workers stayed put in Enugu and many of them are still shuttling between Enugu and Awka for work. The government of Dr. Chukwuemeka Ezeife, the first civilian governor of the state built the Real Estate close to the Government House, which contained only few houses, while the next civilian governor, Dr. Chinwoke Mbadinuju planned the Abuja Estate opposite the Government, the Iyiagu Estate and the Ngozika Estate, although he could not complete them before leaving office. When Dr. Chris Ngige and Mr. Peter Obi mounted the saddle, they were more preoccupied with the opening up of the rural areas of the state and concentrated on road development to the detriment of the housing sector. Investigations by the South East Voice at the Government House, Awka, showed that both governors tried to use private developers for mass housing, but it appeared funding was a major drawback. However, the state-owned Anambra Housing Development Corporation has been serving as a catalyst for housing development and over the years, had developed few estates in Awka and Onitsha, though its efforts could best be likened to a mere drop of water in the ocean. The present administration of Governor Willie Obiano has however announced plans to develop massive housing estates for workers in Awka. A large expanse of land was recently acquired for a multi –billion Naira project expected to be executed under Private Public Partnership, PPP. Some private organizations have also been acquiring land for housing under the sight and services scheme, although some of those who paid for the land are complaining that development was very slow due to lack of funds. Lack of adequate housing has however been having its toll on the lives of the people. Take the pathetic story of Mr. Ikenna Nwafor, a father of six for example. Nwafor was a Grade Level 7 officer at the time Anambra State was created. He managed to secure a two bedroom apartment at Nkwelle Village in Awka immediately he returned to Awka and relocated his family from Enugu. At inception, Nwafor paid N80000 per annum for the house, but with systematic increase by his landlord, the rent jumped to N250000 per annum, forcing him to move his family to his village from where he comes to work. Unfortunately, Nwafor has not been able to build his own house in his village and so, is sharing a family house with other members of his extended family. Nwafor said he could not even afford to buy a parcel of land even in his village because of the high cost. On the average, a plot of land of 50ft by 100 feet in Awka costs between N2 million and N8 million depending on the location and only those in business can afford to buy them. Though land is cheaper in the villages, the fear is that squabbles among families is scaring buyers who often discover that the land they bought for building houses was in dispute. Some communities around Awka and Onitsha have designated some of their communal lands as housing estates and plotted and sold them to people, but the present economic crunch in the country has made it difficult for those who bought the land to develop them. In Umuahia, capital of Abia State, a plot of land in the main city goes for between N2 million and N15 million, depending on the area of the city, even as a plot in new developing areas around the city goes for between N1 million and N2 million, making it difficult for the poor to build or own his/her own house. However, there a number of housing estates initiated by the administration of former Governor Theodore Orji in collaboration with private developers for civil servants in the state. The projects are stalled for now and it is left for the current Okezie Ikpeazu’s administration to continue with the projects which are located at the outskirts of Umuahia or not. In Umuahia for instance, houses have become very expensive to rent, coupled with the nuisance of agents who first collect money from a prospective tenant to register with them and collect another 10% of whatever amount the tenant agreed with the landlord. The agents charge between N1000 and N2000 for registration to enable them look for accommodation for potential tenants or traders. A room apartment in a face-me-I-face you apartment goes for between N2000 and N3000, per month, depending on the area, and the potential tenant is asked to pay between one year and two years. A self-contained one room apartment goes for between N80, 000 and N120, 000, also depending on the location. A two-bed room goes for between N15, 000 and N20, 000, per month while a three-bed room apartment goes for between N20, 000 and N25, 000, per month. However, in Aba, a one- room apartment goes for N3000 per month. While a self- contained goes for N10, 000 per month. Two bed-room apartment is rented for N12, 000 and above per month, depending on the area, while three-bed room apartment goes between N15, 000 and N20, 000, per month depending on the area and the age of the house. Like other places, residents of Aba also face the nuisance of agents who ask for money to register as well as commission. THE cost of accommodation in Ebonyi unlike before has risen astronomically to the amazement of the people of the state. The following factors are responsible for the high cost of accommodation within Abakaliki metropolis. At the time of this report, the rent for a three bedroom flat ranges between N250,000 and N400,000; two bedroom – N180,000 to N200,000; One room self- contained – N120,000 to 150,000 depending on the location while one room with separate toilets and bathroom costs between N2,500 and N3,000 monthly. Tenants are also expected to pay agreement or lawyers’ fees as well as 10 percent agency fees before taking possession of such accommodation. , is the payment of Lawyer fees which is usually an agreement between the landlord and his lawyer while the Agent fees is usually the 10 percent of the total cost of the accommodation. High cost of building materials, greed among landlords and the new tax laws passed by the state House of Assembly are said to be responsible for high cost of accommodation. Rents were cheap in Enugu until few years ago when the Boko Haram insurgents started killing Christians and non-northerners in the northern states, forcing majority of Igbo who were displaced to run back to Enugu. However, residents of the area are now facing problems of high cost of accommodation like other states in the geopolitical zone. In Enugu metropolis, highbrow areas in places like New Haven, Independence Layout, GRA, peg rents on one room self- contained at N130,000 while two bedroom flats go for between N300,000 and 400,000. A three bedroom flat also, goes for between N500,000 and 900,000 depending on the facilities in the accommodation which ranges from availability of overhead water tank, security, parking space for cars and cleaners among others. For bungalows, tenants pay between 800,000 and N1.3 million. Most bungalows come with boys’ quarters inside the compound which the tenant could in turn sublet to other tenants for fee ranging between N60,000 to 80,000. At Enugu North, Enugu South and Enugu East local governments, rents range from N60,000 to N500,000 per annum. A one- room apartment goes for N60,000 a year, excluding agency and agreement fees while a self- contained apartment goes between N120,000 to N150,000 per annum excluding agency and agreement fees. Agency fees for one room self- contained ranges between N30,000 to 40,000 while agency fees and agreements for flats range from N100,000 to N150,000. In the same manner, a two-bed room flat costs N216,000 at N18,000 per month while three- bed rooms go for between N300,000 and N400,000 a year. A duplex costs about N1million to rent and all the prices exclude agency and agreement fees. It is the same situation at the Trans- Ekulu and Federal Housing, Abakpa. Shops costs as high as N50,000 monthly along the Ogui Road in Enugu North and all the fees are without agency and agreement fees. Some landlords demand two years of the rent in advance. Generally, amounts payable for plots of land are dependent on their strategic locations. Highbrows areas of New Haven, Independence Layout and GRA attract amounts ranging from N20 million and N50 million per plot. Apart from the Real Estate which was built by previous administrations during the defunct Eastern Region, the former governors of the state, Chimaroke Nnamani and his successor Sullivan Chime, embarked on the construction several expensive housing estates that were clearly beyond the reach of the ordinary man on the streets. The governors allocated Enugu Zoo Estates to their commissioners and cronies just as they developed the various Golf Estates for top party and government officials. Recently, Governor Ifeanyi Ugwanyi has commissioned 100 two- bedroom flats at Elim Elim Estate, Ibagwa Nike; the Liberty, Trinity and Victory Estates along the Airport Road for civil servants as well as embarked on the development of new estates through the Enugu State Housing Development Authority to ease the acute shortage of accommodation in the state. There are however, private housing estates including Jubilee, Goshen, Elim and Bethel among others where rents are said to be even higher.